With more checklists, more forms, more cross-references to relevant content such as Moore's Federal Practice, Matthew Bender Practice Guide: Federal Pretrial Civil Procedure in California provides total research support that saves you time and effort. 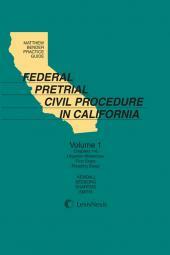 It's the practice guide you need for any federal litigation in California. 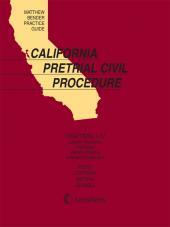 Matthew Bender Practice Guide: Federal Pretrial Civil Procedure in California offers expert analyses, guidance, checklists and forms for total research support. Featuring more of what you're looking for in a comprehensive research system – a task-based format, thorough yet concise content, citable expert insight, twice-a-year updating, a superior print/online interface, sample searches and so much more - Matthew Bender California Practice Guides will help lift your efforts to a whole new level of success. United States District Judge (Ret. ), Northern District of California. Judge Smith was appointed District Judge for the Northern District of California in 1988. She practiced with Bronson, Bronson, & McKinnon, San Francisco, from 1976-1986, and served as a Judge of the Superior Court of California from 1986-1988. Judge Smith served as director of the Federal Judicial Center in Washington D.C. from 1999-2003. At the completion of her 4-year assignment at the FJC, she returned to the U.S. District Court in San Francisco where she retired from office as of June 30, 2005. Judge Smith actively participates in international judicial delegations involved in the modernization of legal processes in countries throughout the world. She received her J.D. from Stanford Law School in 1975. 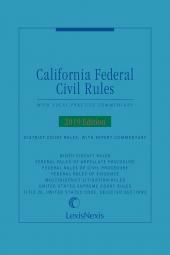 United States Magistrate Judge, Northern District of California Richard Seeborg was appointed Magistrate Judge for the United States District Court in 2001. Judge Seeborg served as a law clerk (1981) to United States District Judge John H. Pratt in Washington D.C. In 1982, he joined Morrison & Foerster's San Francisco office in the litigation department, becoming a partner with the firm in 1987. From 1991 to 1998, Judge Seeborg served as an assistant U.S. attorney for the Northern District of California in San Jose. He rejoined Morrison & Foerster in 1998, where he resumed a litigation practice in the areas of securities, intellectual property, and general commercial matters. He presently serves part-time as an adjunct law professor at the University of Santa Clara. He received his J.D. from Columbia Law School in 1981. Irell & Manella LLP, Los Angeles Richard B. Kendall is a partner in Irell & Manella's Litigation workgroup. His practice focuses on such areas as intellectual property, banking, entertainment, and international matters. From 1980 through 1985, Mr. Kendall served as a U.S. Attorney in Los Angeles, including two years as Assistant Chief of the Criminal Division. From 1986 through 1988, Mr. Kendall was a partner with Munger, Tolles & Olson. From 1988 through 1997, Mr. Kendall was a partner at Shearman & Stirling, where he headed the Litigation Group. Mr. Kendall has served as lead trial counsel in over 30 trials and has argued major cases before the United States Supreme Court, the United States Court of Appeals, and the California Supreme Court. He received his J.D. from the University of Southern California in 1979.